The Interpreter Foundation is pleased to announce that Interpreter: A Journal of Mormon Scripture, Volume 26 (2017), is now available in paperback for ordering. The 396 page volume can be ordered online at Amazon, or better yet, at AmazonSmile if you would like to donate a portion of your purchase to The Interpreter Foundation at no additional cost to you. The volume price is $9.34 plus shipping (or free shipping with Amazon Prime membership). This price reflects the cost of printing only, with no markup or royalty. This bound volume includes all of the peer-reviewed articles that have been published in volume 26 online at MormonInterpreter.com. If you purchase the print edition through Amazon or AmazonSmile, you’ll also receive a free copy of the digital Kindle edition of the volume through the Kindle Matchbook service. Those who have purchased the paperback volumes in the past from Amazon can also access the Kindle edition of those same volumes for free. If you’d like to automatically receive Interpreter volumes in the mail soon after they are completed, please consider subscribing to our annual print subscription for the annual price of $50 (covers our cost of printing and shipping only, without markup or royalty). Annual print subscribers have priority access to our print editions, before they are made available to the general public on Amazon. PDF (free) – can be read on most computers and devices, but text size cannot usually be adjusted. EPUB (free) – can be read on Apple iPad, iPhone, iPod Touch, Barnes & Noble Nook, Sony Reader, Kobo, and most e-reading apps including iBooks, Stanza, Aldiko, and Adobe Digital Editions. This file must be transferred to your device. MOBI (free) – can be read on Amazon Kindle devices and Kindle apps. This file must be transferred to your device. Apple’s iBookstore (free) (coming soon!) – can be read on Apple iPad, iPhone, and iPod Touch. Downloads automatically to your device. Nook Books (free) – Barnes & Noble’s Nook Books store, can be read on Barnes & Noble Nook devices. Downloads automatically to your device. Kindle Store ($0.99*) – Amazon’s Kindle store, can be read on Amazon Kindle devices and Kindle apps on tablet devices. If you purchase the paperback version from Amazon, this Kindle edition is free. Downloads automatically to your device. Google Books, Google Play (free) – Google’s e-book bookstores, can be read on a variety of devices, including Android phones and tablets. Downloads automatically to your device. *Note, this is the minimum we are allowed to charge for this format. 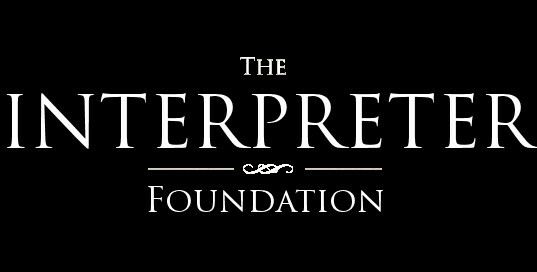 We thank all of the many people who have made Interpreter possible, and the many hours of volunteer work and generous donations which have been given.